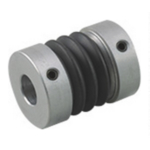 These couplings absorb vibration and have extremely low reaction force from mounting misalignment, thanks to the use of a plastic boot made of resin with excellent elastic properties (polyester resins). They are compact and lightweight, since the aluminum alloy hub and boot are designed with a unitized construction. Thanks to the unitized construction, they are easy to mount and remove, and there is no backlash.